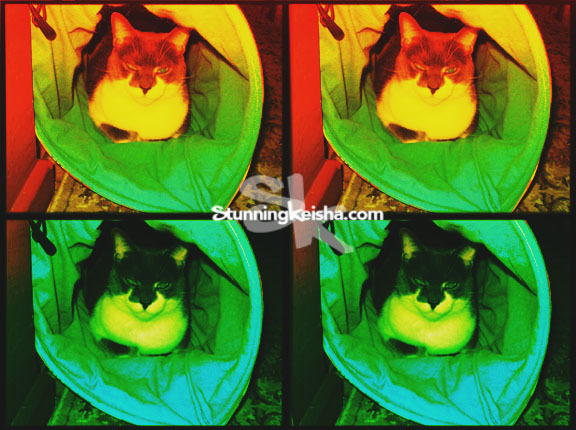 As always I’m participating in the Caturday Art Blog Hop and as always, we’re playing around with Photoshop actions cos they can do so much to a plain image. Can you believe TW wanted to hijack my art post by posting some cat picture she colored in some online program. That ain’t art, Woman! I love love love my Tunnel of Pain & Suffering (that would be TW’s pain and suffering). 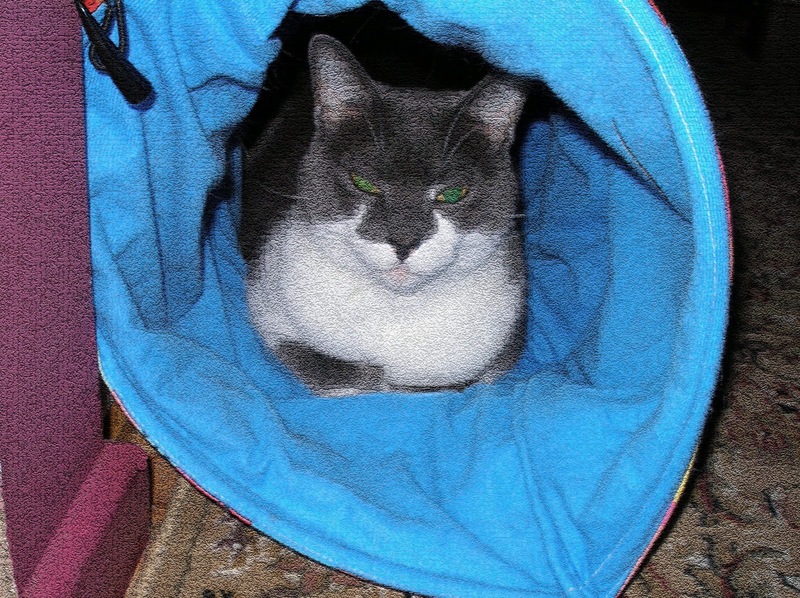 TW likes to photograph me in said tunnel but they usually come out blurry, dark or laser eyes when she tries flash. I decided to fix one of those images by using my artistic skills. In the art above, I first added the Craquelure texture in PS and then applied an Action called Hudson, which I thought made it look more like a painting. Here it is without the Hudson action. It’s most definitely lacking something in My Stunning Opinion. We then loaded some Glitch Actions cos we liked the name—heh heh—and played around with them. The one I settled on was called AntiCMOS. I wasn’t sure I liked all the green in the art image so I messed around in the settings and added a bit of blue. Yeah, that was the finishing touch. Four Keishas, no waiting. Have a pawsome rest of the weekend. Are you planning anything big? 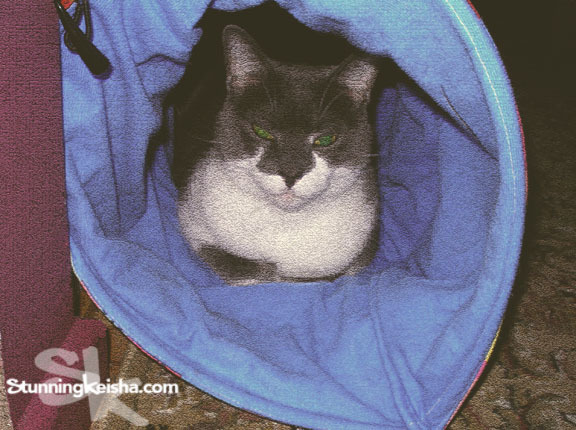 Thanks to Athena and Marie for hosting the pawsome Caturday Art Blog Hop every week. Without it, TW would still be clueless about photoshop. Stop by the see some creative anipals strutting their newest art images. *which* I *said* which, really I did. But the stoopy secretary typed what. Phhftt. More incompetence. I love the texture of the first photo! You are always artsy CK! Wowwie! Grrl Furrend! Yous looks spectacular! But which is the real yous??? I like the first one the best. I also would like to join you in your tunnel, CK. Great artwork, CK! I want a tunnel, you're very lucky. We love it.....we're going to have to try Glitch Actions! Four CKs? How cool is that! We love your art this week. Excellent job. The photo went from having a mundane composition (not the subject) to being an interesting piece of art. Love the artwork. Pretty cool tunnel too. Great fun!! Our human could fool around all day on Photoshop if we let her... which we don't... a cat does have to eat, you know? Purrs from the Zee/Zoey kitties! You look so cute in your tunnel! I think that quad at the end is super cool and arty. I hope you some fun with your Kong mat. Unfortunately, Pierrot tore off the mousie so now it holds even less fun for him. The result is very nice ! Looks good to us and your mom is feeling better. Great art images! It's really good use of blurry, dark photos! That's some awesome art, CK! Very artistic! You are, as always, stunning! No surprise you are a true artist CK, stunning and lovely in every way. What would TW do without you to serve and worship daily?